I was hired back in 1986 to be the Managing Editor for a new academic economics journal, at the time unnamed, but which soon launched as the Journal of Economic Perspectives. 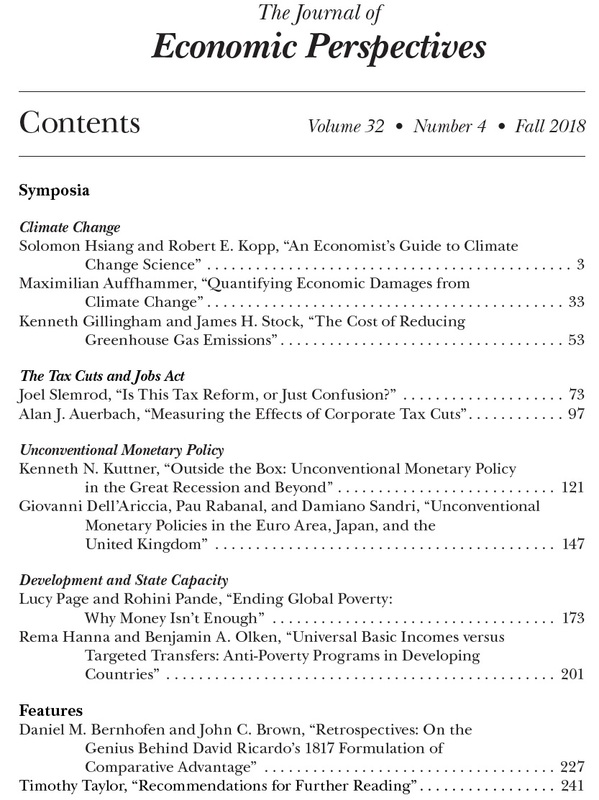 The JEP is published by the American Economic Association, which back in 2011 decided--to my delight--that it would be freely available on-line, from the current issue back to the first issue. Here, I'll start with Table of Contents for the just-released Fall 2018 issue, which in the Taylor household is known as issue #126. Below that are abstracts and direct links for all of the papers. I may blog more specifically about some of the papers in the next week or two, as well. ________________________________Symposium on Climate Change"An Economist's Guide to Climate Change Science," by Solomon Hsiang and Robert E.